Do you like riding through the bush and wetlands? If yes, this ride is for you. It follows two creeks starting in Ferntree Gully and finishing at Dandenong. The first leg along Blind Creek is mostly downhill. For much of the time the creek is underground (blind? ), surrounded by a mixture of houses and bush and, very briefly, Knox Shopping Centre. Eventually, Blind Creek makes a proper appearance amongst reeds with bush surrounds. You will go under Eastlink, after which there is a short, relatively gentle, uphill stretch before turning onto Dandenong Creek Trail at Shepherds Bush. The next leg, flat and easy going, is through paddocks alongside Dandenong Creek to Jells Park with excellent views of the Dandenongs. At Jells Park there are great views of a wildlife lake, with ducks and other birds on view. 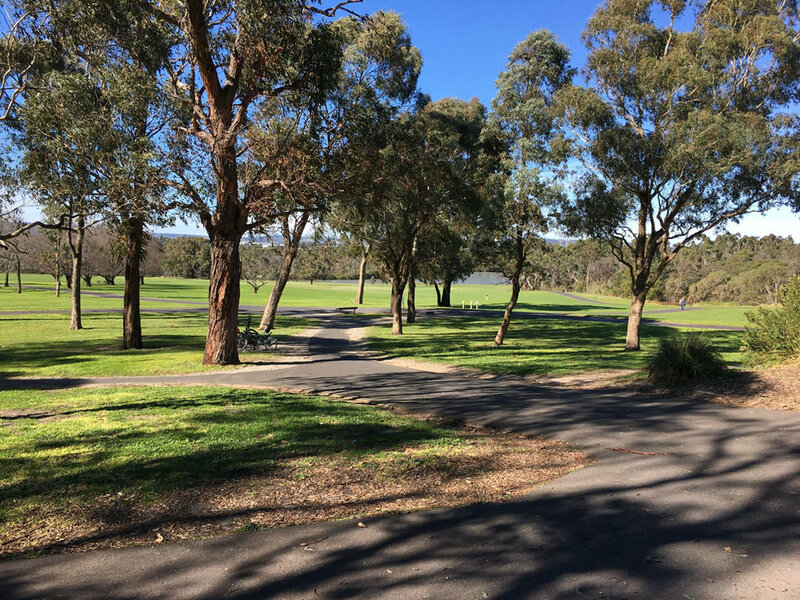 From Jells Park you follow Dandenong CreeK Trail through 12 km of parks and wetlands. Watch for herons, willy wag tails and other birds. As you approach Dandenong, Dandenong Creek becomes a concrete canal. Dandenong is a bustling city. You may enjoy a visit to Dandenong Market for a snack. While there are cafes at Knox Shopping Centre and Dandenong, the obvious place for a break is Jells Park. Here a short hill leads up to Madelines Cafe, a great spot for coffee, and with toilets. The cafe is a bit noisy so you may prefer to get take away from the kiosk and sit outside at tables and chairs. The ride is mostly along bike paths. It is mainly flat or downhill with a very short section on a well-maintained gravel path. The whole route is characterised by underpasses so that you ride for kilometres without any main road crossings. The ride starts on the east side of Ferntree Gully Station. Follow Belgrave Ringwood rail trail north alongside the railway line for 1.2km. Ignore the bridge over the railway line on your left and look for a side path that goes under the railway line. This is Blind Creek Trail. Turn left. Follow the trail west for 400m to pass the turn off for the Tim Neville Arboretum. Follow the signs to Knox City as the path continues mainly west for 4.3km. It passes under several main roads and crosses some quieter streets. Eventually you will reach Knox City Shopping Centre. The path continues on an embankment alongside the shopping centre. Instead of riding along this, go down to the left to ride on the concrete footpath. As you ride keep the shopping centre on your left. At the end of the footpath, you meet the bike trail coming in from your right. Turn hard left to turn towards the shopping centre before turning right and going to Stud Road. Turn left and ride on the footpath to the first set of lights. Cross the slip lane and Stud Road and turn left on the bike path there. Take the first left turn on the bike path to go under two memorial arches to Oppie (Hugh Oppenheimer). They have cut out bicycles on them. Go under Burwood Road. This is the continuation of Blind Creek Path. From here follow signs to Eastlink Trail. Continue on this path for 3km going under High St Road and Eastlink. Turn left immediately after Eastlink to stay on Blind Creek Path. Follow this for 2.8km to Nortons Lane. Turn left and ride 950m south along Nortons Lane past St Pauls College and along the trail as it turns west. The first left turn is Dandenong Creek Trail. Turn left. Follow Dandenong Creek Trail for 1.7km staying left until you cross a footbridge to enter Jells Park. Note Madelines Café is to your right. If you are not stopping for a break, continue straight ahead at the four-way intersection just beyond the bridge. The lake should be immediately on your left. Warning: Google Maps is not correct at this point. Ignore two turns leading uphill to your right. At the next intersection, near the jetty, continue straight ahead under the power lines. Continue to go straight parallel to a parking area on your right. Just before Ferntree Gully Road, turn left and after 200m turn right to go under this road. You are now on the combined Eastlink and Dandenong Creek trails. Continue on the combined trail for 3.7km going under Wellington Road and under Eastlink. After passing under Eastlink, immediately turn left to stay on the Dandenong Creek Trail as it splits off from Eastlink Trail. Continue to follow the trail for 8.1km, going under Stud Road, Monash Freeway and Heatherton Road until you find yourself riding through a car park and driveway leading to Clow Street. At Clow Street, turn left to cross the creek on the shared path and turn left to go under Clow Street in a u-turn. Here the creek has turned into a concrete canal. Continue to follow the path for 1.2km to Box Street. Turn right to cross the bridge and right on the other side of the creek to do a u-turn back under Box Street. Wheeling your bike turn left onto Foster Street, then cross Princes Highway and then Cheltenham Road to stay on Foster Street. Dandenong Station is on your left. by starting at Glen Waverley Station (north side). Go down Railway Parade towards the east to cross Springvale Road. Go down Glen Road which is 25m to the south of Railway Parade. At the 3rd roundabout turn right into The Outlook. Take the 1st left into Townsend Street and ride to Gallaghers Road. Cross Gallaghers Road and turn into Shepherds Road 25m to your left. Continue down Shepherds Road and straight ahead into the park at the end. After you cross the creek take the first right onto Dandenong Creek Trail (unmarked). The left turn at step 15 above is at the same point. starting at Belgrave Station. The path follows the train line to Ferntree Gully Station. continuing further on the Dandenong Creek Trail as it extends past Dandenong to Carrum. This section is not covered on this website.